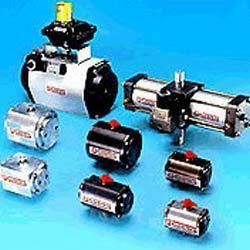 Manufacturer of a wide range of products which include rotary actuators. Fluidtecq make Pneumatic Rotary Actuators for Ball Valves/ Butterfly Valves are used in varies industrial applications. All Rotary actuators are Rack and Pinion design and are available in 90 deg and 180 deg options. These have high torque to weight ratio for faster cycle times. Ideal for ball valve, butterfly valves, dampers, indexing mechanisms. Main body housing rack and pinion is made from solid bar stock or close grained casting. The outer surface of the actuator is specially designed and has a smooth surface (special design on demand) for typical pharma application - hence cleaning becomes very simple. Ball valves / Butterfly valves of required sizes & materials and can be coupled with pneumatic actuator (single acting, spring return or double acting) and solenoid valves. Dom type position indicator for on-off indication can also be provided with above assembly. Above valves can also be provided with Pneumatic / Electro-Pneumatic Positioner with input supply of 3-15 Psi / electrical signal of 4 to 20 mamps for percentage opening of the valves. Looking for Rotary Actuators ?